Holland had her 5th surgery today...the fourth on her eyes. 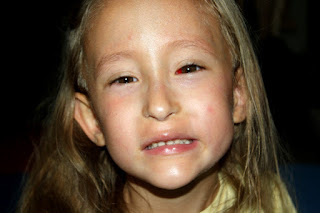 When she still in the NICU (October 2004) she had laser surgery on both eyes for ROP, then a follow-up laser surgery on only her left eye a couple of days later. Just before her first birthday (July 2005) she had surgery to correct strabismus (crossed-eyes) and the doctor moved the inside muscle on both of her eyes. We knew going into that last surgery that there was at least a 50% chance that she would need another eye muscle surgery in the future. So, today we did it again. This time she had two muscles moved in her left eye and one in her right. 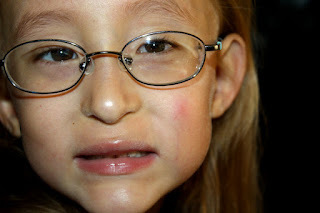 We initially decided to do the surgery because her left eye was still intermittently turning in, and being the weaker eye (significantly more nearsighted) is at risk for developing amblyopia (lazy eye). The hope is that if the eyes are better aligned there is an improved chance that she will use them equally well and will develop appropriate binocular vision with her glasses. 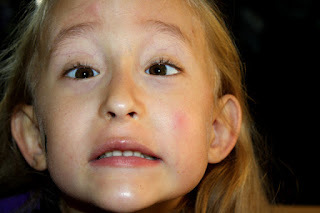 Since we decided to go ahead with the surgery, we also decided to move a second muscle in each eye...the one that causes one of her eyes to roll too far when she is moving her eyes from one side to the other (which eye depends on which way she is looking). 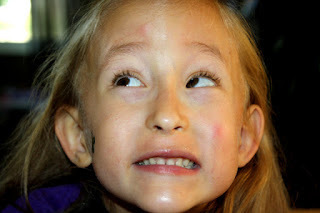 Her ophthalmologist told us that she would NOT do surgery to move those muscles only...but since we were doing the other muscle in her left eye we would do those at the same time. I tried really hard to get some good before and after pictures to show everyone what I am talking about. It's difficult because she doesn't look at me when I take her picture! Often she will turn her face in my direction, but her eyes will be looking somewhere totally different. I had to tell her, "Holland I want to take a picture of your eyes. You need to look RIGHT AT ME!" The other problem is that close-up, with her glasses on, you can't always see the eye turn. It happens more when she is not wearing her glasses, is looking at something far away, or is tired. Anyway...here are some "before" pictures. You can see the left eye turning in slightly here. Here is the eye roll thing...see how the right eye is rolling further then the left? If she is looking the other way, the opposite eye will do this. And sometimes, like here, you can't really see the eye turn at all. I promised Holland a trip to the toy store to pick out a new Scooby-Doo toy if she did a good job today. That was all it took, and she separated from us without any tears. It helped that she knows her eye doctor really well because she has been seeing Holland and Eden since they were tiny babies. Dr. Tisch said that Holland was very brave right up until she fell asleep. There were no complications with her breathing or vitals, and the surgery itself went very smoothly. Recovery was a little rougher. There were a lot of tears, shaking, and shivering as she was waking up. She was pale and wanted to be held. Then she was upset because she wanted the IV and Pulse-Ox OFF. She wouldn't stop crying and kept asking for the "Doctor." "Doctor please take this thing off!" It took me a few minutes to realize that any time I mentioned "go home" she got more upset. I finally figured out that she didn't want to "go home!" She was expecting to go STRAIGHT to the toy store for that surprise I had promised. John and I immediately started saying, "okay, stop crying and drink something so we can GET OUT OF HERE." But every time the nurse would come by she would say "go home" and the tears would start again. Finally Holland told her she didn't want to go home, she wanted to go to the toy store. And the nurse responds, "oh you can't do that...you need to go home and rest and take it easy today." Thanks lady. I get what you are trying to say but you are not helping me!!! We finally got it together enough that we could leave and we headed STRAIGHT TO THE TOY STORE. Well...she ended up throwing up in the car on the way there, again on the floor of Toys R Us, and twice on the drive home. But by golly she got that Scooby-Doo toy, and while she wasn't feeling great physically, and least she felt good emotionally. We had a 6:30am arrival time at the hospital, and were home by 11:30am. She was exhausted by the time we got home and ended up taking a 4 hour nap. When she got up she had a bath and some lunch. 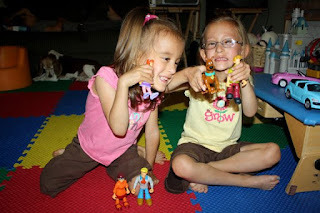 Then she watched Scooby-Doo while playing with her toys and seemed pretty much back to herself. Her eyes are bloodshot and puffy, especially her left, but overall I think they look pretty good and straight. We'll have a better idea in a couple of weeks what the end product will look like. But you know, I thought she was beautiful before. And I think she's beautiful now. Everyone in your family is gorgeous. I can't believe how popular Scooby Doo has become. My kids watch it every morning too (and we have the same toys). Wishing Holland a speedy recovery. Javier has to patch his eyes, left one day, right the next, all 24 hours of the day (even at night). We have been told he has strabismus and other people have told us he has lazy eye. We have too much in our plate, so we have decided to wait until his next app. to tackle the eye issue. We have also asked an app with a great eye dr for a second opinion and she could not see us until october!! I had the same surgery when I was young....she will be just fine!! Hope she has a speedy recovery! Both of your girls are gorgeous. I love how she is letting Eden play with her toys so nicely! And also how well Eden seems to be doing with sitting up on her own! CONGRATS Holland on another brave/successful/healthy surgery! Man, Holland knows what she wants, huh? That's what I call dedication! Holland, get better soon. My son also had the same surgery on July 10. His doctor is Rebecca Tisch. Her office is located in Canton, MI. Could it be the same doctor? If so, Wow! I am glad Holland was so brave. It makes it so much easier on parents! All my best to all of you. Your girls are adorable! These surgeries are fascinating to me. I have strabismus and lazy eye. I had vision screenings as a child and one eye exam then but it was missed. I found out in grad school when we did visual testing on one another and my results startled my group. I had a lot of trouble at one job because I couldn't handle the paperwork well because I couldn't see well in the way it was designed (a weird grid). Now I have a great eye doctor who figured it out in 2 seconds and gave me a corrective lens set-up that somehow bounces the info to my good eye from my lazy eye. I don't have good depth perception, but of course I never did. This explains a great deal about why some parts of driving were very hard for me to learn and why my friends have made fun of me for turning my head a lot while driving. They should be glad: this way I can see! I do sometimes wonder what it would be like to have had this corrected so that I had experienced normal or more normal depth perception and tracking. Poor little Holland, I hope she feels better soon! Yay Holland! Sounds like she was very brave - and so were you for taking a sick child straight to the toy store for her well-earned reward! Praying for healing and great results. Holland is beautiful indeed. I had both surgeries as an adult and I think it is great you are doing them now!! I will never have binocular vision (too late for me) but it is amzing how much my quility of life improved once my eyes were aligned. For some reason people automatically assumed lower intelligence due to my eyes. I also avoided eye contact due to the lazy eye, crossed eyes issue. All this to say Kudos for staying on top of the issue, you really are doing her a huge service! and Bravo to holland for being so brave. Hope she feels better soon! She is so brave and yes so beautiful!!! We just found out on Tuesday that my son has to have strabismus surgery in November. His left eye turns in more than his right. We are very nervous about it and his recovery, so it helped a bit to read about Holland experience. Thanks for sharing and hoping she has a swift recovery!! Your right Billie she was beautiful before and even with that puffy eye she's still beautiful. It's a treat to see her wonderful eyes without her glasses they are so pretty. I found your blog through the CP Moms group. Your girls are absolutely adorable! I am so glad that the surgery went well. Holland sounds like a pretty strong little girl (especially when it comes to getting a toy - there was no getting out of that deal!). I hope she has healed nicely and is doing well. I had surgery on both eyes 30 years ago for strabismus, except it was a weekend-long miserable affair including 2 eye patches. Though I wear glasses, I've always thought I have the best eye problem in the world, because I can see fine without my glasses for swimming etc, unlike my friends with more "traditional" near-sightedness! Great post! Been reading a lot about this eye condition. Thanks so much for sharing!